Andover 60-inch Single Vanity in White with Marble Top in Carrara White with Porcelain Sink & Mirror The Andover 60-inch vanity with top was designed with an updated approach to traditional styling. It was crafted with an attention to detail, featuring strong, classic lines and decorative carved flourishes. 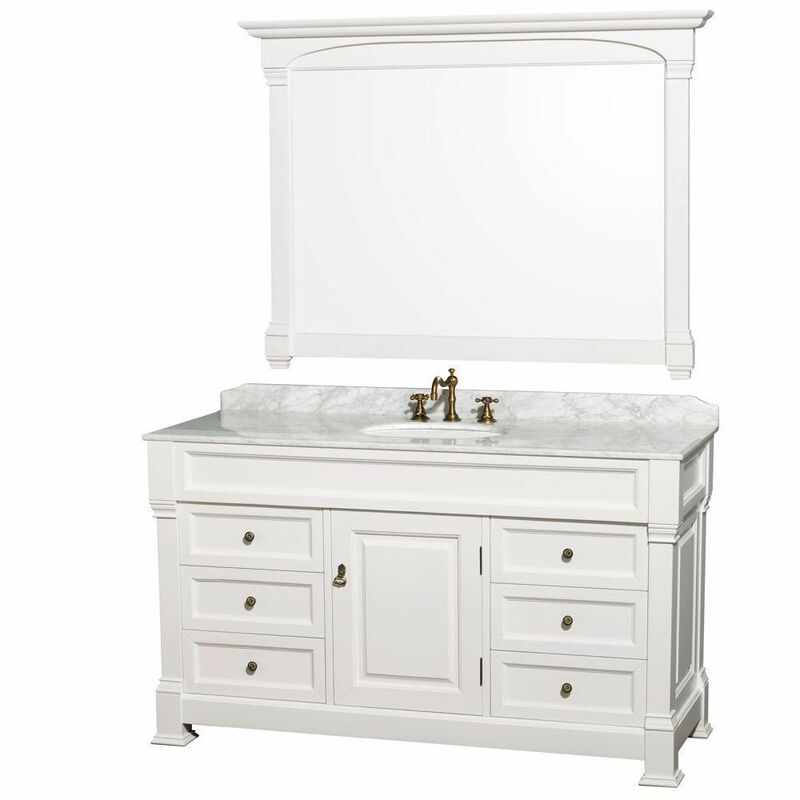 The white vanity and Carrara white marble countertop are hand-carved and stained, and offer ample storage space. Andover 60-inch Single Vanity in White with Marble Top in Carrara White with Porcelain Sink & Mirror is rated 4.9 out of 5 by 16. Rated 5 out of 5 by HomeDepotCustomer from Looks great. It is just what I was looking for.... Looks great. It is just what I was looking for. Rated 5 out of 5 by HomeDepotCustomer from We could not be happier with the vanity set. ... We could not be happier with the vanity set. Quality is A+. Rated 5 out of 5 by Patti from Absolutely beautiful! A wonderful addition to our bathroom. ... Absolutely beautiful! A wonderful addition to our bathroom. Rated 5 out of 5 by HomeDepotCustomer from I received my vanity and I am very pleased, beautiful... I received my vanity and I am very pleased, beautiful and a lot of storage. Rated 5 out of 5 by Robert from The merchandise is far better than I expected.....vanity made with... The merchandise is far better than I expected.....vanity made with precise construction. Mirror a great accent piece. Counter top a great quality piece. All items were shipped to my home....NO DAMAGE done. Packed extremely protectively....no cracked mirror or vanity marble counter. No dents to wooden vanity. I was prepared to have damaged products....the joke was on me! GREAT job Home Depot!